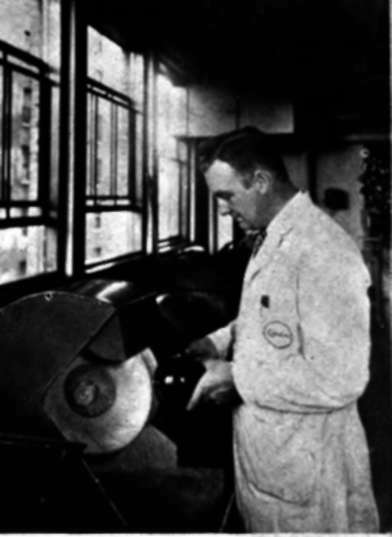 Aside from the "cut-off wheel" a special type of saw used in commercial plastic work, the band-saw (Plate Q) is the most commonly used type of saw for this work. A wavy-edged hack-saw type of blade is most popular. 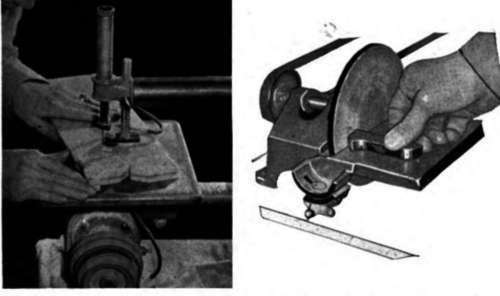 The reason for the popularity of the band-saw as compared with the circular is the fact that any given point on the blade has several feet of travel in which to cool off before it again approaches the work. Ordinary woodworking blades can also be used, although they do not stand up as long under continuous work. The preference is for wider blades as these cut a straighter line, and can be worked against a guide clamped to the table with greater success than a narrower blade when straight line cutting is wanted. For irregular contours of coarse, the narrower blades are used, the same as in woodworking. The upper guide supporting the blade should be set as close to the material being sawed as possible, as the material will stand considerable forcing against the blade, cutting more than proportionately faster as compared with light pressure. The only limit to the amount of pressure to be applied is the power of the motor, and the point at which objectionable heating begins. PLATES N, O, P, Q. Cast resin plastics may be turned on any type of woodwork-ins; lathe, huffed and polished with cotton or muslin wheels, sanded and shaped on sanding-helts, and sawed with regular woodworking hand-saws. 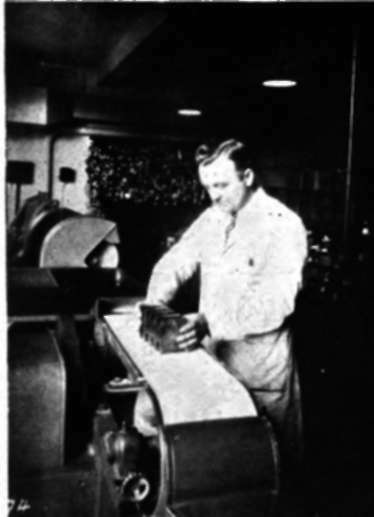 In Plate Q is shown a type of "cradle" on which cylinders are placed in commercial shops while being band-sawed. This insures a steadier, straighter cut than free-hand holding of the cylinder, if a straight cut is important. Ordinarily however the cylinder is held in the hand and pushed straight into the blade, and rotated slightly toward the blade at the end of the cut. Surface speed should be 1300 feet per minute or more and blades should have 14-15 teeth to the inch. Sanding belts for sanding irregular contours are frequently mounted on the band-saw in place of a blade, and work quite satisfactorily on certain types of work. Ordinary woodworking blades of the medium - to fine-toothed type are used in jig-sawing plastics, and ordinary woodworking methods, in every respect. These machines are used to a great extent in cutting out costume jewelry shapes from sheet stock, and the cutting is very rapid (Plate R). Blades should be narrow to permit quick turns, and the speed of the saw as high as it will stand without damage. The saw can be forced as much as the skill of the operator will permit, and the blades should be changed frequently. Outlines are drawn on paper pasted directly on the sheet with rubber cement, or if the sheet is dirty enough, can be drawn on with pencil (a pencil will make no mark on a clean sheet). In production shops, the designs, if being made in sufficient quantity, are laid out on a master of paper the exact size of the plastic sheet, arranged so as many as possible out of the sheet, and then a printed sheet is made up, and these are pasted to the plastic sheet before going to the jig-saws. Several sheets are frequently sawed at once. Schools or small manufacturers might adapt the same idea, using a mimeograph or hektograph sheet instead, or even carbon paper, making as many copies at once as possible. 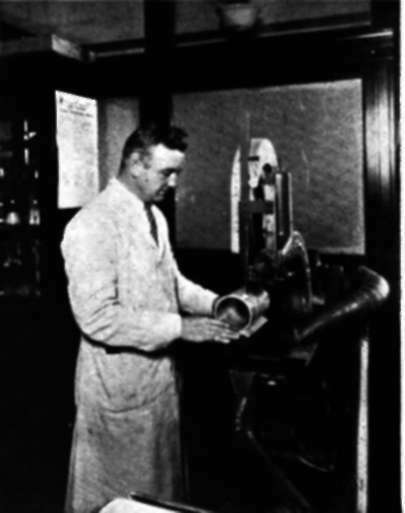 PLATE R. (Above left) Conventional Jiff-saw equipment is used for cutting; intricate patterns in plastic sheet. 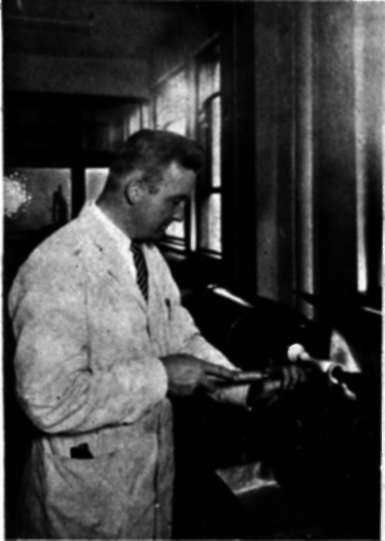 An interesting adaptation of the jig-saw in plastic work is its use in buffing and polishing the edges which have been jig-sawed. If the proper type of fine-toothed blade travelling at high speed has been used, no sandpapering or rough buffing is necessary, merely a light buffing and final polishing. Since the buffing wheel cannot possibly reach into these fine corners, especially the inside corners, some other means must be devised for final finishing. The easiest way to do this is to take a length of soft heavy cotton twine and loop it four or five times in place of the jig-saw blade. The buffing or polishing compound is then held against this cotton "blade" while it is moving, charging it with compound, and then the work is held against it, polishing it quickly. The question of heating must be watched very closely while using a jig-saw on plastics, as the blade has little chance to cool off between strokes. A blower is practically a necessity in the first place to keep the fine dust off your guide-lines, and it also helps in cooling. Beyond this, always keep a sharp blade, and as long as it is free-cutting, heating will not be objectionable. As soon as it becomes dull however, or the blade is caused to bind by inexpert handling or trying to take too sharp turns for the size of blade being used, the material will heat and expand and bind still worse, and the material will quickly char or become discolored. The discolored or charred part will crumble and can never be polished—the only remedy is to sand or cut it off completely.